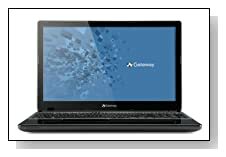 Gateway NE52203u is an entry level laptop that is quite capable of performing well at your daily needs like talking on Skype, browsing the internet, preparing school assignments, watching videos and more, with its powerful AMD Dual-Core processor. It has a nice silky silver color and is only 1 inch thin with a weight just over 5lbs. Now offered at a great price on Amazon too. AMD E-Series E1-2500 dual-core processor at 1.4GHz speed and 4 GB DDR3L SDRAM provide sufficient power, speed and ability to run a few tasks at the same time. 500 GB SATA hard drive should be enough for most people- it is plenty of space to store even the large multimedia files. Operating system is the much loved Windows 8 🙂 - common on most of the latest notebooks. 15.6" HD Widescreen Ultrabright LED-backlit Display with 1366 x 768 pixel resolution at the 16:9 cinematic aspect ratio and AMD Radeon Graphics Card with a RAM size of 512 MB is what you'll get in terms of display and graphics. Images are quite clear, especially for a computer this cheap. Built-in speakers and audio system supplement the beautiful picture quality with rich and loud sound. Keyboard is nicely designed with useful function keys, a multi-gesture touchpad for intuitive navigation of multimedia and a numeric keypad for quicker number keying-in. 4-cell Li-ion Battery should give you about 4.5 hours in average use. 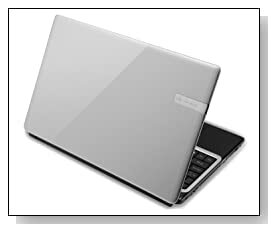 Gateway NE52203U has the beautiful silky silver color, weighs a little over 5 pounds and is only 1 inch thick. For connectivity, you have the standard 802.11b/g/n Wi-Fi wireless, 2 x USB 2.0 ports, 1 x USB 3.0 port for 10 times faster transfers, an advanced HD Webcam, HDMI port for better HD movie experience on a larger screen, Digital Media Card Reader- Secure Digital Card for a cableless way to transfer photos from your camera and smart phone, Bluetooth to be able to connect to other Bluetooth-enabled devices such as phones, printers etc. without needing a wire. Pros: Beautiful color and looks - Great keyboard design - Good quality sound and display - Powerful and fast for a budget computer - Light and sleek - Affordable. Cons: Windows 8 for some - No DVD / CD Rom. Conclusion: The Gateway NE52203u 15.6 inch notebook is nothing less than what you need, and more. It is quite functional, easy to use and does not distract you from what you want to do on the computer. As long as you are not buying a laptop to play the latest 3D / high-end games or to run heavy memory-intensive multimedia editing programs, it will be quite handy to have and carry around, to school or work. It offers more than what you would normally get from a computer at its price range. Highly recommended!